I found a very interesting app when surfing the Internet, and downloaded it to my MacBook. Now I want to install it on my iPhone. I wonder if there is any way possible to do that. I will appreciate any helpful suggestion, thanks. Many people would like to install some interesting apps on their iPhone, and they can find many related apps in the App Store. Maybe some iPhone users will use their Mac computer to download the apps to iTunes library at first, and then sync the apps to their iPhone. This should all easy to be done, but if the iPhone users find an IPA file on the Internet, and want to sync this IPA file to their iPhone, what should they do? The post may give you an answer about how to transfer apps to iPhone on Mac. It is very lucky to find an iPhone app you like on the Internet, and it is also easy for you to find it in App Store. App Store provides millions of apps for iPhone, iPad and iPod touch. If the users want to locate a certain app, they can use the search function of App Store. Then they are able to find the app they need. Then they are able to download the app and sync it to their iPhone with iTunes. Start iTunes and go to “iTunes > Preferences > Devices”, and check “Prevent iPods, iPhones and iPads from syncing automatically”. Plug iPhone into computer via the USB cable, and iTunes will launch automatically. If not, you need to manually start it. iTunes will recognize your iPhone and display the iPhone icon at the upper right corner. Click the iPhone icon, and choose “Apps” in the summary panel. Click “Files > Add Files to Library” to add the apps to your iTunes library. Then drag and drop the apps into the right part of the window. iTunes will sync the apps to your iPhone. When the sync is done, you will get the apps in your iPhone. After the syncing process, the apps will be installed on your iPhone, and you are able to enjoy them now. In certain circumstances, the apps won’t be installed as the data of the apps are not complete or the installation is interrupted. Note that during the syncing process, iTunes will erase the non-purchased items. If you want to get rid of the sync of iTunes, you can take advantage of the third-party iPhone transfer for Mac. 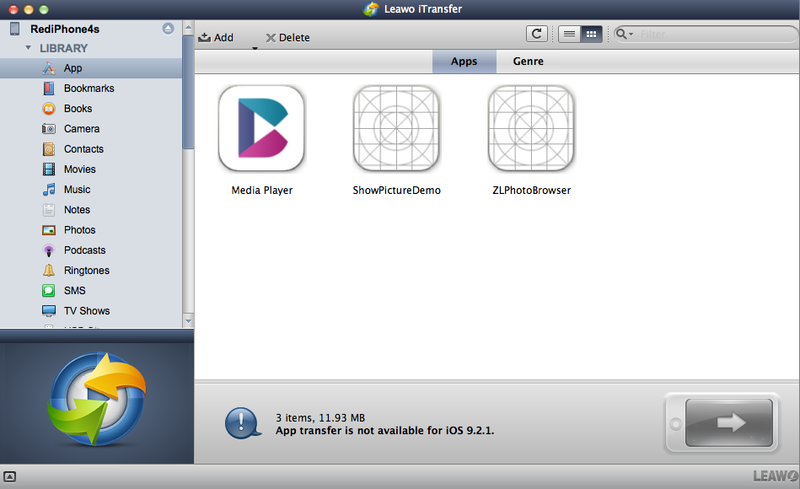 Among all the data transfer programs for iOS devices, Leawo iTransfer for Mac can be regarded as one of the best. The software enables users to transfer files among iOS devices, iTunes and computers without the sync of iTunes, and it helps to transfer various kinds of files, including apps, music, movies, TV shows, ringtones, ebooks, photos and Camera Roll with ease. 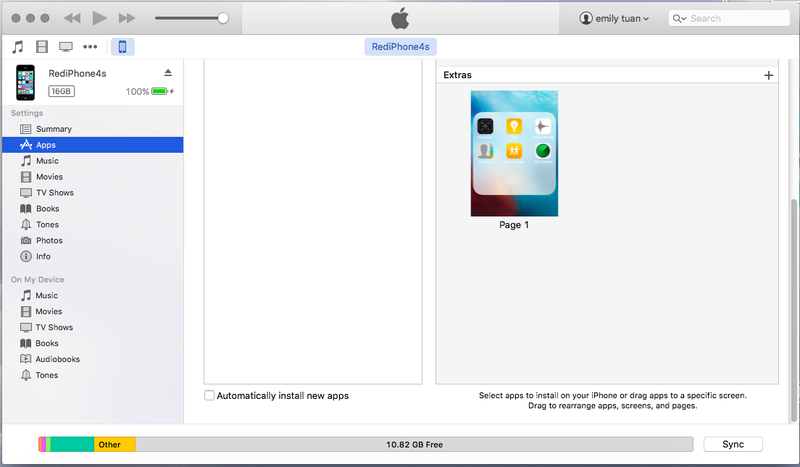 The following guidance will show you how to transfer apps to iPhone on Mac without iTunes, and you are allowed to free download the software to have a try. Note that the trial version has limited transfer times. 1. Run Leawo iTransfer and connect iPhone to computer with the USB cable. The software will automatically detect the libraries of your iPhone, and then show the libraries in the left sidebar. 2. Choose “Apps” library in the left sidebar, and then the contents will be shown in the right part of the window. 3. 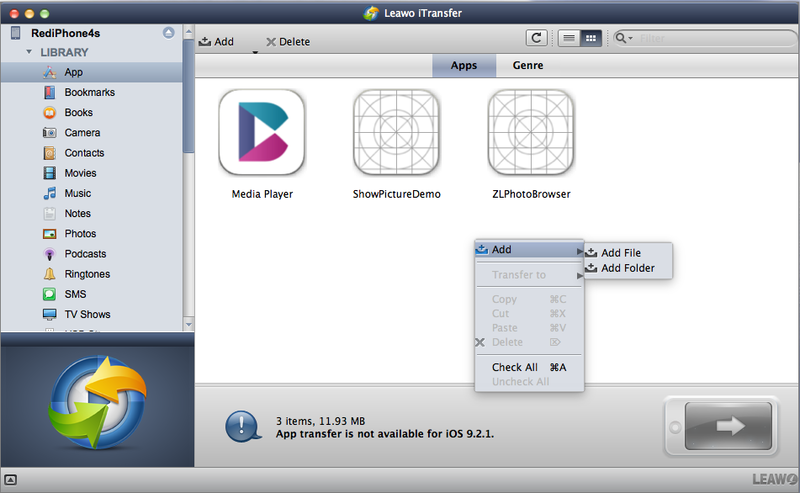 Click “File > Add > Add File/Add Folder” at the upper right corner to add the IPA files from your computer.Leawo iTransfer will start transferring apps to iPhone immediately. The progress bar in the pop-up dialog will show you the percentage of the transfer process. When the app transfer is done, you will get the apps in your iPhone. 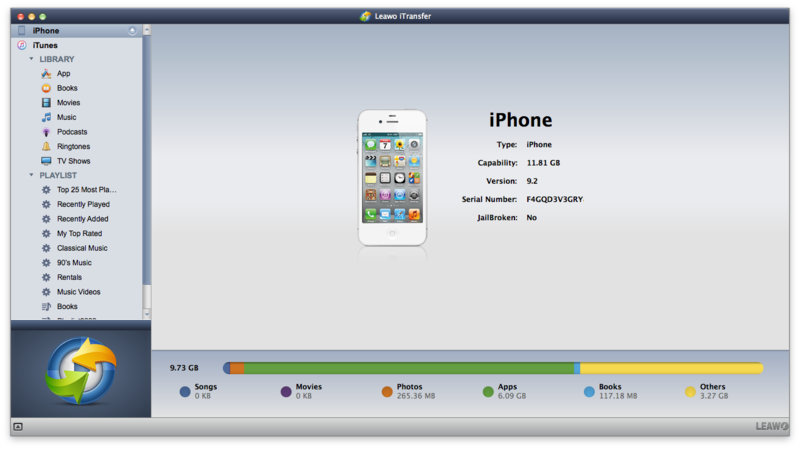 Note that if the IPA files are not complete, they will not be transferred to your iPhone. With Leawo iTransfer, users are able to transfer files between iOS devices, for example, users can transfer ebooks from iPad to iPhone with the help of this software. If you are interested in this software, just free download it and have a try.